Beware the Ides of March, they say, and that’s good advice even if you’re not a Roman emperor! There’s something about the middle of March that can trip us up. Spring’s almost here, but not quite…the last lingering remnants of snow still linger at the edge of the paddock, and the wind is colder than we like it. It’s easy to get down in the dumps. Sometimes when you’re feeling a little blah – or maybe it’s not you, but it’s someone you know and cherish that’s having a tough time – the best thing to do is give yourself a little gift. The nice thing about horse jewelry is that it can provide that instant little “pick me up” – simply looking at a new piece of horse jewelry for your collection can put a smile on your face. And is there any better way to cheer someone up than with a personal, thoughtful gift that says “I was thinking of you”? 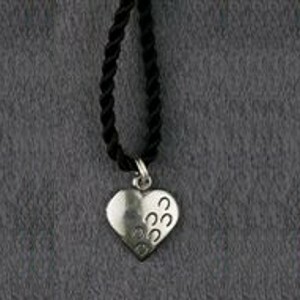 We really like the Hoofprints on Your Heart sterling silver charm necklace for this purpose. It’s a simple piece, on the petite size, with half a dozen tiny hoofprints on a sterling silver charm. Appropriate for any setting, this charm reminds us of the unconditional love we get from the horses in our lives. Even when everything is going wrong, our horses love us – – and when everything is going wrong AND we have carrots in our pocket, well, then our horses love us twice as much. The Hoofprints on My Heart design is also available on a pin and on a bangle bracelet. 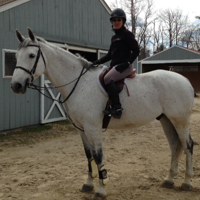 The necklace is a big hit with younger horsewomen. Teens are particularly fond of it. The charm comes on a black silk cord, although for a more formal look, you could switch it to a narrow sterling silver chain. A great gift for yourself or someone you love – perfect to put a smile on their face!